Slap bass is a technique difficult to describe in words, so we made this video to accompany the slapping chapter of our book Bass Technique Finger Gym. Although one could write a whole book on the topic of slapping alone, this video is a quick way to get started with slap bass. Relax your hand and curve your fingers towards your palm. Keep your fist relaxed and make sure your thumb doesn’t touch your fingers and your fingers don’t touch your palm. Keeping your thumb straight, align your hand shape so that your thumb runs parallel to the strings of your bass. Achieve this by moving your arm position, not moving your hand from the wrist. Your thumb should be just above the very end of the fretboard. Strike the string with the outside edge of the knuckle of your thumb against the frets. The aim is to rotate your hand down to strike “down and through” the string. Slap the open E string in 1/4 notes. The small “t” above each note indicates the use of the thumb slap on the picking hand. To execute a pop, use the same hand motion as described in the slap section, but in reverse. With your index finger, hook the string you want to pop as you rotate your hand back up towards you. Curl your first and second fingers into a grip/hook shape. Hook the string you want to pop and rotate your hand back up towards you. Don’t pull with your finger; your finger stays almost still while the power comes from the movement of your arm. Each slap sets up each pop and vice versa. Play these four notes using the pop technique explained above. 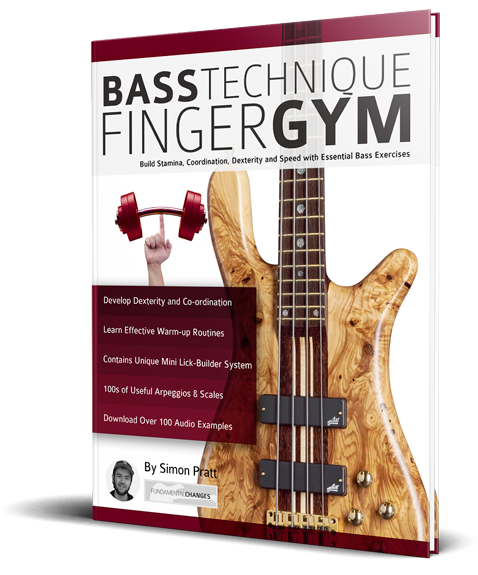 Bass Technique Finger Gym goes in to great detail and contains over 130 exercises to get you playing bass like a pro.